Imagine the amount of mauj and masti when two most popular Khans of Bollywood would come together on screen. Yes, first time on Indian television, hunky Salman Khan and perfectionist Aamir Khan are coming face to face in reality show Dus Ka Dum. Aamir who is rarely seen on small screen will play the game with his cousin Imran Khan. The episode will be another sort of promotional activity of Aamir for Imran’s Jaane Tu Ya Jaane Na. It will be aired on July 4th, the same day when Jaane Tu Yaa Jaane Naa will hit the theatre. This will be Aamir’s third appearance on small screen after Amitabh Bachchan's Kaun Banega Crorepati and Little Champs. 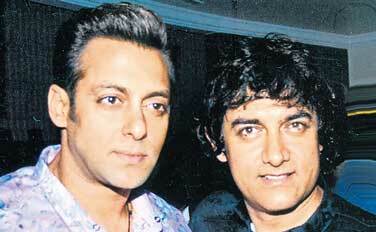 The show will be a treat for those millions of TV buffs and Aamir and Salman Khan's admirer. With every passing day, the popularity of Dus Ka Dum is touching sky high. Like any other shows, Dus Ka Dum has also started inviting celebrities from different arenas. It got inaugurated with cricketers Harbhajan Singh and Yuvraj Singh. Salman Khan doesn't need a reason to throw a bash. The large-hearted Khans are known to be good hosts. So it surprised no one really when he had a party at his Panvel farmhouse for the crew of 10 Ka Dum. Says a source present at the party, "They gathered to watch the first episode of 10 Ka Dum together. There were no filmi personalities present; only the cast and crew of 10 Ka Dum and Salman's family his parents and sister Alvira, close friends like Sajid Nadiadwala, and about 100 people from the unit of DKD including technicians, assistants etc. Salman had food catered and it included different cuisines like Chinese, Continental and Mughlai. There was the famous biryani cooked by Salman's mom. The party went on till 7 am." There were some highlights, the eyewitness points out. "The producer of DKD, Siddharth Basu's Synergy Communications wife Anita Kaul Basu gave an emotional speech on Salman and what a wonderful person he was. Everyone was in great spirits and everyone was having a blast. At one point, a 'high spirited' Sallu jumped into his swimming pool fully clothed! Girlfriend Katrina was missing as she was out of the country. The crowd was largely in the age-group of 18-25, and soon everyone jumped into the pool, including Siddharth Basu. Sallu was thrilled with the response he got from his guests about his first ever TV appearance." Siddharth Basu confirms, "It was a private party. Salman, as is his wont, invited the entire 10 Ka Dum team of Synergy and Sony to watch the opening show together with his family at Panvel. At some point Anita gave a short speech thanking everybody for making it happen and Salman, for being a big-hearted host."